Igor - No problem! I love the cafe, I'm just an opinionated old designer lol! I always have an issue with the 3D community. It seems like once most of my fellow 3D Generalists leave the 3D environment (i.e. websites, print, branding) they forget to make things look as beautiful as they do in their scenes! No to mention, like you said, this and most forums are set up without the ability to make pretty. We love this Cafe and community for sure and we have some neat plans for the future,but we need time to make everything ready etc. Closest to theme you provided is this one https://community.invisionpower.com/files/file/7726-haze-by-ips-themes/ ...would this be something you could look at? ...would this be something you could look at? ABSOLUTELY! That's lovely, organized, easy to read and very modern. I have a feeling we're in good hands! Great,I'll see that we take that theme next week. Or I will try to make something like that from a new theme we introduce yesterday. but in the last 1 or 2 days, something changed with the "default" theme, which is the one i like most. The text seems to have gotten very grey, and now there is not enough contrast between it and the background. Could someone maybe change that? : just looked again: ips support (default) works well and looks nice. did you able to try NEW theme we introduce few days ago? You are talking about the ipbForo? its nice. Just the white 1px strokes everywhere are a bit strong i think. if they where darker, or simply removed i think it would look much cleaner. But i do like it. its pretty easy on the eyes. What about now? I spend few hours and still trying to make it as clean as possible. Nice set of new themes, I like that there's a reasonable amount to pick from. It allows me to pick and choose depending on what mood I'm in, especially dark ones. Not sure I like being referred to as an 'oldtimer' though, lmao. My eyes and hands maybe starting to breakdown early, but I'm still only 39 and not quite ready for the scrapheap yet! How about 'geriatric' or 'fossil' lol. We will have one more unique theme and some more variations and I hope that would be enough to please some. "Cafe Oldtimer" dose not represent age of the person,but instead how long that person is here with us. Our apologies if that sounds offensive. We just want to have unique/funny/not boring tags/names for our members. Like for example nitroman2007 ,I gave him a Plugin Virtuoso tag,and I think wee all know why is that. No offensive taken Igor. I did find the name 'Oldtimer' funny, I'm just not ready to be one yet. 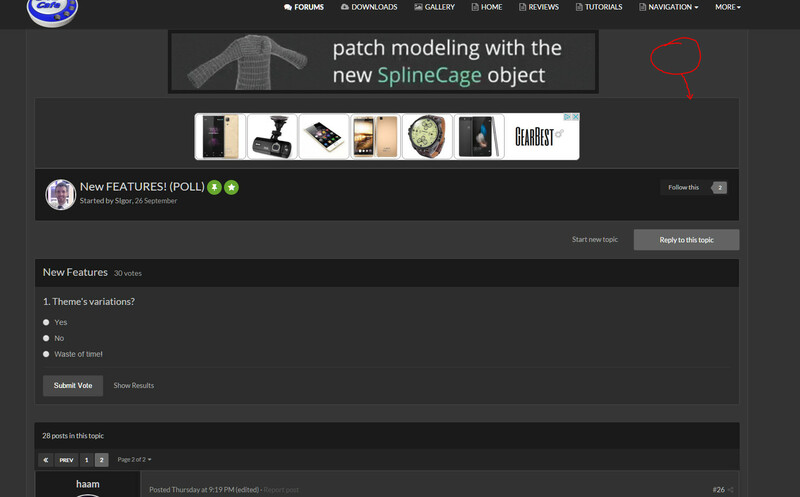 Guys I made many changes to forum design,I hope you like it. If you find something not readable,please let me know. its better, but those strokes are still too much, ( stroke the 1 pixel porbder around all the boxes. they just stand out soo much.